15 May 2017 --- Discarded food contains a significant amount of nutrients that could be used to help many Americans meet daily requirements, according to a new study. 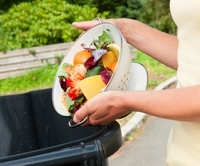 It is estimated that around 1,217 calories per person per day are squandered as a result of food waste in the US. The study, published in the Journal of the Academy of Nutrition and Dietetics, looks beyond the caloric value of food waste and focuses on the nutritional value of the food we throw away. Investigators found that discarded food contains large amounts of key nutrients like vitamin D, fiber and potassium that could help people get the food they need to meet their daily recommended intake. In 2014, 14% of US households suffered from food insecurity and an additional 5% experienced a shortage of resources that forced them to skip meals or reduce their food consumption. Across the population, Americans are not getting the recommended intakes of certain nutrients including dietary fiber; calcium; potassium; and vitamins A, C, D and E. At the same time, Americans continue to waste food at an alarming rate throughout the food supply chain. It is estimated that 31-40% of the post-harvest food supply is discarded. This study was the first to demonstrate the substantial amount of nutrients, including many under-consumed nutrients, wasted due to food discarded at the retail and consumer levels of the US food supply. Quantifying the loss can motivate related investments and support the case for registered dietitian nutritionist engagement with these efforts. The estimates can additionally serve as a baseline for tracking intervention impacts. The study, led by Roni A. Neff, PhD, Program Director at the Johns Hopkins University Center for a Livable Future (CLF), and Assistant Professor, Department of Environmental Health & Engineering, and Marie L. Spiker, MSPH, RD, CLF-Lerner Fellow and Doctoral Candidate, Department of International Health, Johns Hopkins Bloomberg School of Public Health, found that losses of under-consumed nutrients were significant. Food wasted at the retail and consumer levels of the US food supply in 2012 contained 1,217 kcal, 33 g protein, 5.9 g dietary fiber, 1.7 mcg vitamin D, 286 mg calcium, and 880 mg potassium per capita per day. Using dietary fiber as an example, 5.9 g dietary fiber is 23% of the RDA for women. This is equivalent to the fiber RDA for 74 million adult women. Adult women in 2012 under-consumed dietary fiber by 8.9 g per day, and the amount of wasted fiber is equivalent to this gap for 206.6 million adult women.